I hope your week is going well! You'll be happy to know that I've spent the last three days doing online research and even offline research (remember libraries?) to find out which department handles how many days there are in the month of November. What happened was Hammy and I have NOT been kanuckling down like we promised. In fact, we've been fiffing and faffing (we hope those aren't dirty words somewhere cuz that's happened before on this blog) and now we find ourselves short of time. So. We knew it was too much to ask for another month to be inserted between November and December, although that's really what we need. Instead, we started a petition to add just one day. After all, most of the other months have 31 days, so it's not like it's a big deal. It's not like stars and moons and ocean currents and things have to be involved. Or do they? Well, anyway, that's what's been happening. If you'd like to sign the petition, please let me know. All signatures need to be received at the Post Office address by yesterday at 4:30. Thank you! Now, how about some shiny gold, so shiny it will blow your spectators right off your face! I have kept this one last sheet of this gorgeous gold-embossed vellum paper in my stash waiting for the right design. Recently, I was at Mike's and I found this sweet set of pine cone and holly stamps from Inkadinkado and shazambam! 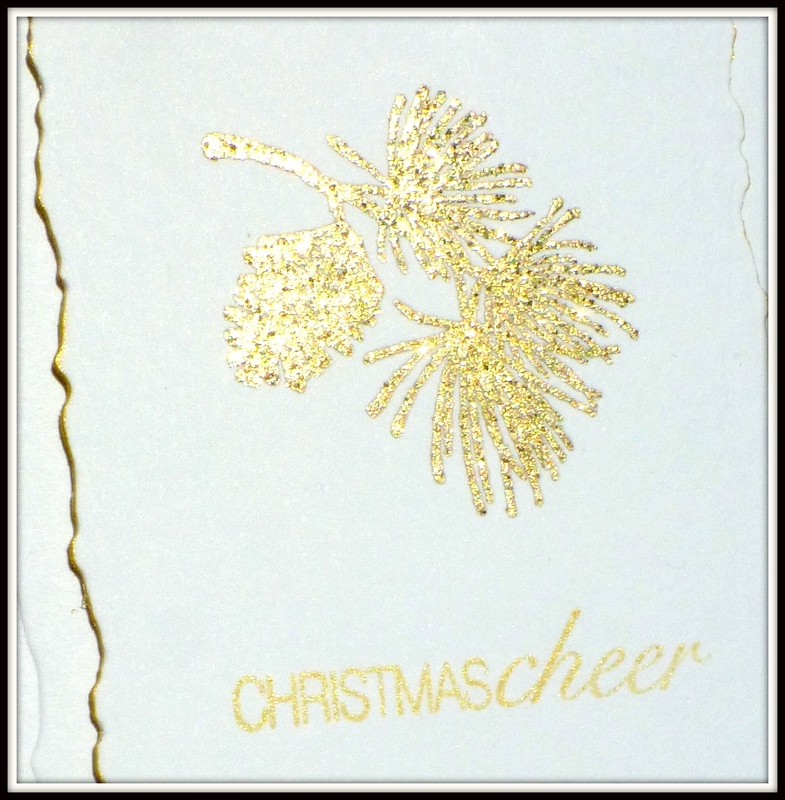 The sediment from PTI is stamped in Brilliance galaxy gold and the little pine cone and evergreen stamp was embossed in glitter gold. Here's another view of the shine, which is hard to capture. Christmas Card Throwdown: Sketch. I used rectangle instead of oval. 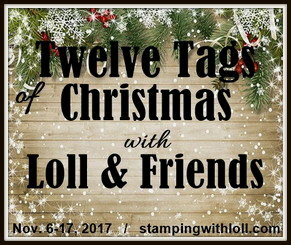 The Holly and Ivy Christmas Challenge: Anything goes. 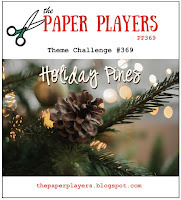 The Paper Players: Theme challenge: Holiday Pines. I was also going to enter the above card in the CAS Mix-Up November Challenge, but then I realized, can I though? 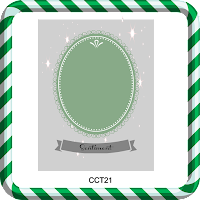 Where is the white space required to make a card CAS (clean and simple)? So I made this second card using the little piece of vellum that I cut off the original 6x6 paper. I stamped and glittered and die-cutted and heat-embossed. I forgot to tell you that I ran the galaxy gold ink pad all around the deckled edges of the die cut panels to add even more shiny gold. You know, because there wasn't enough. That's my last sheet of pine cone vellum, but I do have other sheets with stripes and dots and chevrons, so I'll be making more of these in both gold and silver. Real quick. 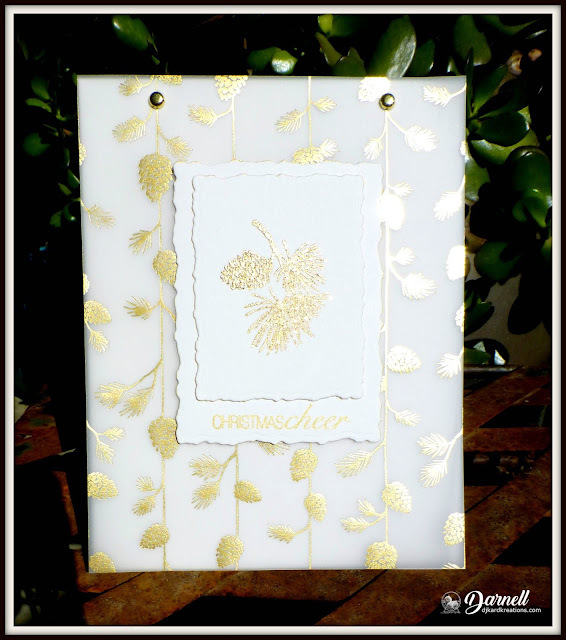 The other day I posted a pretty card for the We Love You Dawn hop. Here is another card I made for Dawn, this time using one of the fabulous sets she has designed. Dawn is all about bold colors and flowers and the Hop is filled with magnificent bouquets for Dawn! Leave it to me, I went simpler and less colorful because I've always loved this sweet little "Whale Wishes" set she designed back in 2011! To me it's a classic that will never go out of style! The whale and sediment and little hearts and drops are all from Dawn's set. The blue waves were cut from a NBUS "Breezy Waves" die by Memory Box. After wards, I ran it through the BS using a Cuttlebug e/f. I think it's called "Branches," but it does a good job impersonating waves. I hope your recovery is moving forward smoothly, Dawn! Oh, wow~that is a beautiful piece of vellum and you showed it off beautifully! Gold is so classy, like Hammy. Your sweet whale can really swim with those unusual but cool waves! Nice twofer!! Wow and wow! I love your gold cards. They are beautiful and elegant - like your heart! Thank you for the fabulous card you sent to me ... I appreciate your kindness and thoughtfulness. All that glittery gold is just beautiful... 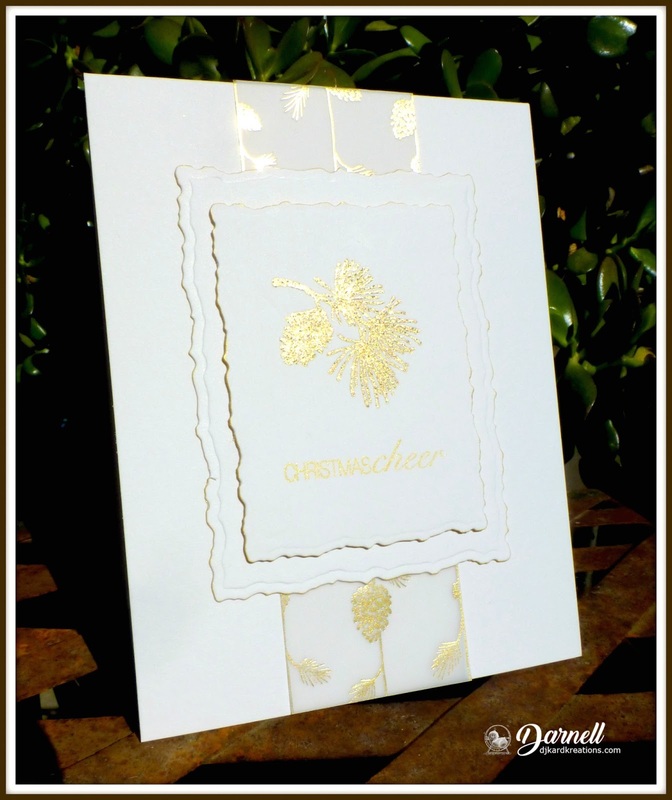 I LOVE that embossed vellum, it looks so elegant and rich on both of your gorgeous cards! Fabulous cards - I love the gold pine cones on your Christmas cards. Thanks too for your comments about the doormat outside our campervan - we do get some funny looks but I'm not sure if that's because of the doormat or us! Hi Darnell, Loving the elegant cards and the whale one. What sparkle!! Oh your cards are stunning! And that little whale is adorable on your arsty BG... Thank you so much for your kind wishes... Thinking of you my friend! Wow, that vellum is so pretty! Great way to use it up, Darnell. The gold makes everything even more beautiful. Your card for Dawn is very sweet! I'm sure she will be touched by your thoughtfulness. Hugs! These are just lovely with the deckled edges and gold embossing! Loving the whale card for Dawn too, and I am SO sorry I missed the deadline for signing your petition! I need to get my radar tuned up so I can see your posts well in advance next time to avoid missing another deadline! ROFLMAO! Fab cards Darnell! Love the cute whale and how your embossing reminds me of water. 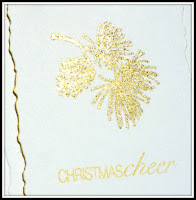 The pine cone ones are gorgeous as well and the embossing is so pretty. Wish I could see the vellum one in person because I don't think the picture does it justice... those are so hard to get a good photo of but it is a stunning card. You've prepared wonderful cards. Love them all, but my heart goes to the little whale. Oh Darnell, I am swooning over your gold creations. SO elegant and festive. Gorgeous! WOW! Super elegant card. Love this gold and white combination. Both cards are gorgeous, Darnell! I love all the gold shine. Yes I will sign the petition for the extra day, it should be called National Catch Up Day! Thanks for sharing with us at The Paper Players and regards to Hammy! Oh, I'm so sad that your asking haven't had a positive answer!! I really need some days- oh, well, some MONTH!! LOL :D - between November and December!! Anyway, you and hammy are using the little time so well, both these cards are FABULOUS! Amazing elegant design and shining for the first one, and LOVE the bold colors and the cute&fun whale!! Fabulous both the embossing (heat and cold),too!! My eyes, my eyes...so much shiny, rich, glorious gold. Can barely see the card for the glow of it (kidding). If I were you right now, I'd be mourning the loss of that amazing paper but delighted with the results of it's use and your efforts. Both cards are super gorgeous and I think I spotted a winner, AGAIN. I'll sign that petition! Ohhhhh, your gold sprigged vellum cards are spectacular! Here it comes... WOW! I absolutely adore your card for Dawn, too. It's super sweet for "get well". I'm working away at Christmas cards... at a snail's pace. Better luck to you! I'd certainly sign up for another month but could we have it in spring please? or summer at least. Would that also mean we didn't get as old so quickly? The gold, white and vellum is beautifully delicate and the gold on the deckling is the perfect touch. A stunning card! I like the idea of another month! Your gold cards are so elegant and beautiful. That is some shine all right. And, I love the whale card too. That is so cute and a fun design as well. Happy to sign the petition...could you get them to stretch it to a week?!! Beautiful shiny gold, my word I haven't had any lovely vellum like that in my mitts for years. It looks marvellous, lovely grown up cards! Such beautiful cards with the gold. Very elegant. ooh, I love gold cards, they are really impressive! Love all that glittery gold, so pretty. I think that both of these cards will meet the rules of participation in the CAS Mix Up Card. What a splendor! I love both projects with gilded vellum. And the third card impressed me with your creativity. I love how you made waves :-) You are a genius! This embossed vellum is worthy of Midas, my friend! Both cards are so elegant! 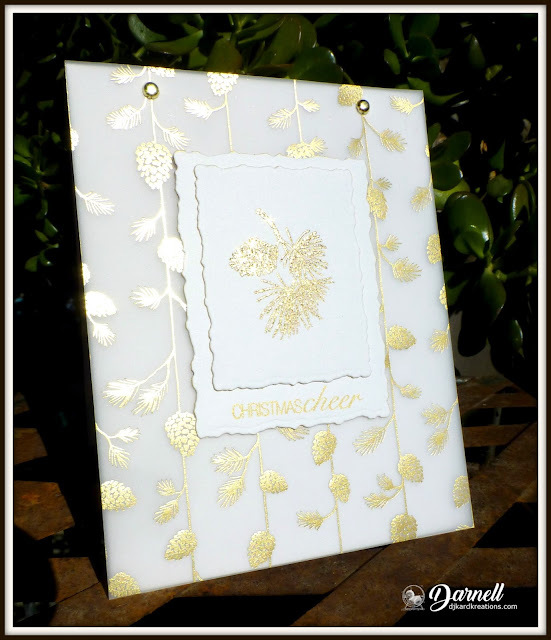 I'm loving the glittery embossing that goes with it! And your little whale is so sweet! Great job on doing the waves with branches! Who would know? They are all just fabulous Darnell, love all the gold, looks very classy and the whale card is just a brilliant design. Your golden glittery cards ate stunning and the whale is adorable! I will sign that petition, that is an awesome idea, that day would be spent making Christmas cards!!!! And thanks for especially making another card for CAS Mix Up! So nice to see you in the gallery! What a wonderful richness of gold - it's making me sparkle all over! 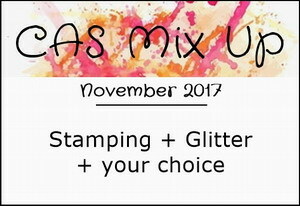 The glitteriness is perfect for CAS Mix Up - thanks so much for joining us! Three stunning cards Darnell especially the first one. 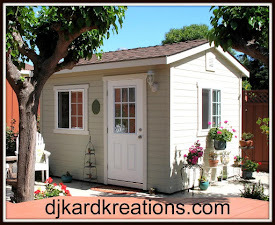 It is a busy time at school right now, so I am placating my crafting desire with a look at others' creations. Your gold and white card is stunning. I vote for tow 29ths in November because that's my birthday...oh, wait, I don't want to age that fast. Time is always short around the holidays. Enjoy yourself when you can and let the rest slide. :) Thanks for the crafting inspiration and a healthy dose of giggles. Such a cute whale card for Dawn! That embossing folder is a good choice to simulate ocean waves and ripples, too. She will enjoy seeing the whale set in action! I can see why you'd hoard that lovely vellum, Darnell. It's gorgeous and so is your card. Well, both cards really. Way to go to CASify your original so you could enter the challenge. I've wanted those deckled edge dies but the cost has kept me with my hands in my pocket. What stunning cards!! I love that vellum and I would have hoarded it too. Can't find stuff like this anymore either. 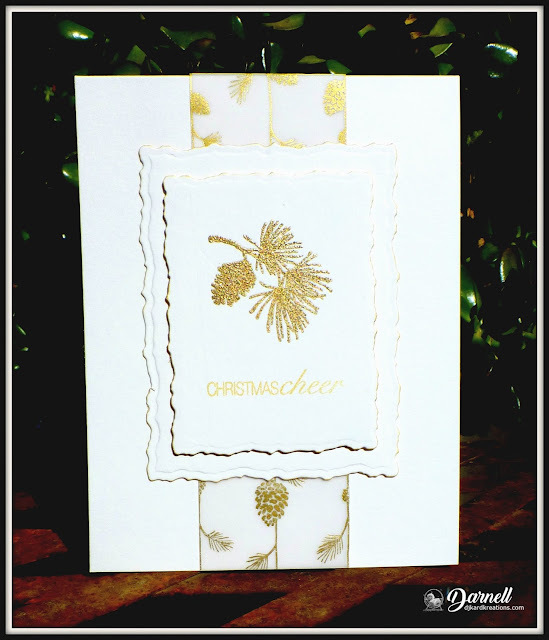 Your addition of the pinecones on the front of both cards is stunning!! Great design!! Your golden cards are downright regal! Very elegant and pricey-lookin'. I do love your whale card. It's so sweet in its simplicity, but it has a lovely strong message for Dawn. I am certain she "whale" appreciate it! Love both of your dazzling gold embossed Christmas cards, Darnell! And, the sweet card you made for Dawn! Beautiful cards Darnell ..... love the little whale but, WOW! what a stunner with the gold ones. In my opinion a girl can never have too much gold and these definitely fit the bill. LOVE this glorious gold cards, Dolly! The vellum paper is gorgeous, no wonder you've been saving it for "just the right card". And I lovely your shparkly pine cones. Thanks for sharing your white space card with us at CAS Mix Up! We truly appreciate it! what super brillant cards and your designs as always are so brilliantly created. Beautiful vellum that is, and so stunning the cards made from it. Such a cutie whale card also. Wow, Wow & Wow ! I have no words to qualify these beauties Darnell ! I can't keep my eyes on them ! So stunning this beautiful gold patterned Vellum, and the design you've done to use it is just striking! I Love, love them ! And this little whale is so adorable ! You rock ! Could you please add something else on your petition? What do you think about adding an extra hour (even more if possible) to every day for the last 3 months of the year ? Sign me up to that partition! I need an extra month I feel like the year just began! As for going to the library - I still go most weeks for my knitting/craft/talk group. A golden delight! Let me also say that the cute little whale stamps out swimmingly! Such a great post. Wow, this is stunning! I love your golden pines! Everything about them is very elegant, both versions! 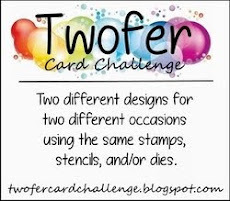 So happy that you shared these with us at the Paper Players and my Holiday Pines challenge! That vellum is beautiful and your cards are stunning. I wish I hadn't missed the deadline to sign the petition for extra time. A day wouldn't be enough but a month might do. Christmas always sneaks up on me. You would think since it is the same time every single year I would get it. The e/f you used for waves is just perfect and the blue ones just added to them. Please let us know when the new month is approved and what it will be called. Wow one gorgeous card, breath taking. The whale card is adorable and will be lovingly appreciated. Your cards are wonderful, as always! The gold is absolutely beautiful, and I love that whale image! I don't know about adding another day to November...I'm always ready for the next paycheck to arrive, and adding even just one day would make my wait even longer. lol Hope you're doing well. Darnelll, I just love all that glittery gold goodness! If I owned that vellum and gold marvelousness, it would still be sitting in my stash as I doubt there'd ever be a card good enough for it. However, yours is an absolute delight with the sweet pinecone in the centre - clearly, you are much wiser than me! Thanks so much for joining in with us at The Paper Players this week. All that glittery gold is GORGEOUS! 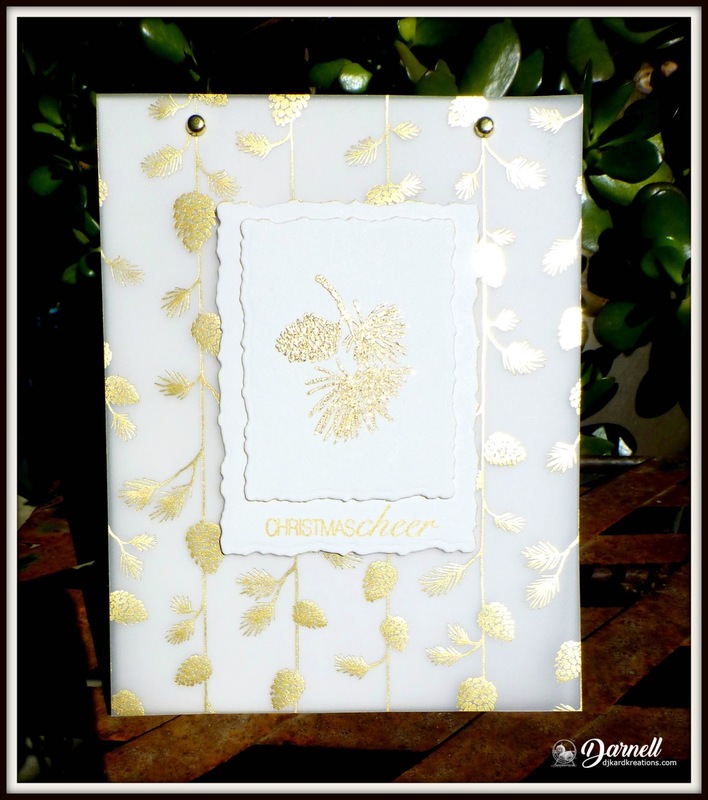 I love gold and love your gold cards, Darnell...so pretty!! The vellum softens the card, which adds a special touch, too! And, your sweet whale card for Dawn is just darling!! I can see why you were saving that sheet of vellum, it's fabulous, but I think you've definitely done it justice. A really lovely card. Thanks for joining in with the Christmas Card Throwdown. Your cards are golden shimmery perfection! Your gold cards are so elegant, Darnell. And I love the whale. I absolutely LOVE your golden pine sprig card! I've got quite a few pieces of "need just the right card" DP on hand around here too. Also have never thought to use the Branches e/f as waves. That's a new one for me. Will have to try it sometimes. Thanks for the inspiration. Your white and gold cards are spectacular! Don't know if I could have brought myself to use that gorgeous vellum, but then what good does it do in a drawer, right? 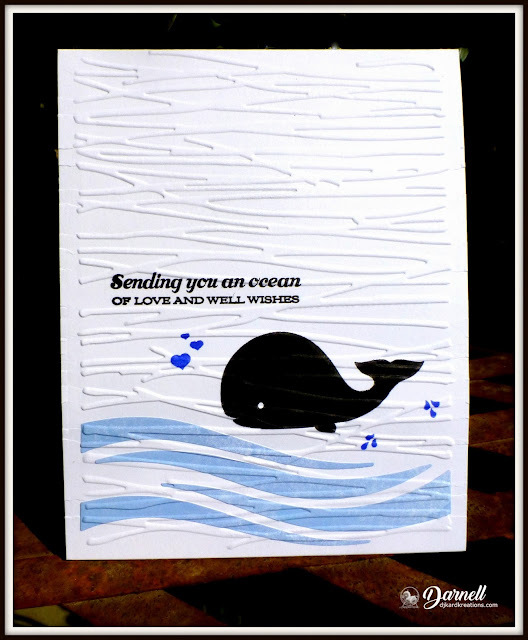 Your whale card is adorable and the branches make very convincing waves! Thanks for the idea! An elegant and rich card. Gold on white is always the best combo. Love the composition, simply gorgeous. Love your CAS card, thanks for joining us at CAS Mix Up! That vellum is gorgeous and you have used it beautifully. 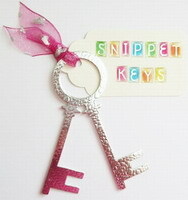 Must try that with stamps and gold embossing powder. If you find that extra day, let me know lol! Congrats on your HM at Christmas card Throwdown, Darnell! Fabulous cards, as always, but my fave is the first - your saved that piece of vellum till just the right time!! Love that gold detailing and your main focal image is perfect!!!! Congrats on your OD at CAS Mix Up, Darnell! It means I'm in good company. Also love the clever design of your card for Dawn. May have to use my ef to create some waves, too. Sorry I haven't been visiting more often lately, but it seems that someone (or something?) stole not just one day of November but an entire year. Where did the year go? !